Fudge is so delicious and smooth that it is hard to enjoy just a bit, but these simple individual fudge bites make it easier to have a reasonable portion. I have one daughter who loves fudge, which is odd because she doesn’t really like chocolate. Go figure, just when you think you have your kids figured out they change it up on you. Such is life. She was really craving fudge and while I was in the pantry looking at the chocolate chip bag and asking her if she would rather have cookies I spotted the recipe for Famous Fudge on the side of the bag. I checked to make sure I had evaporated milk on hand and marshmallows and made her the treat. I am not sure what I did wrong but the first time I made the fudge it took me 3 attempts and the help of my non-cooking husband to finally get it right! I was scandalized by how easy it was for my husband who has a hard time making anything more than mac and cheese from a box or heating up convenience food. I was upset to say the least. 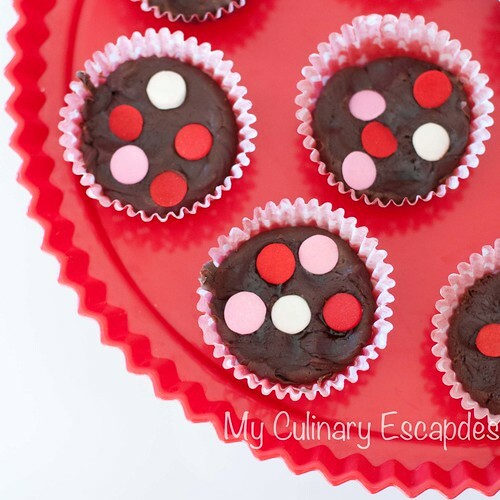 I am proud to report on the day I made these individual fudge bites I was able to create the recipe all on my own and they turned out! You wouldn’t think that would be such a victory for me but it was. I was so happy! These individual bites are the perfect size for my daughter. 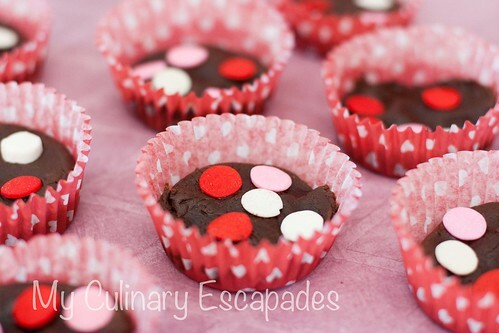 I used a regular cupcake pan and poured the mixture into liners to create these little serving cups. It was so easy to tell her to have a fudge bite and not have her cut off a square of fudge too big that might give her a stomachache. I topped them off with some fun large sprinkle quins to celebrate Valentine’s Day. Combine sugar, evaporated milk, butter and salt in medium pan. Bring to a full rolling boil over medium heat, stirring constantly. Boil, stirring constantly, for 4 to 5 minutes. Remove from heat. Stir in marshmallows, chocolate chips, and vanilla. Stir vigorously for 1 minute or until marshmallows are melted. Pour into individual cupcake liners and sprinkle with your choice of sprinkle. Allow to set up for several hours. Remove from pan by sliding a knife in the edge to lift up gently.